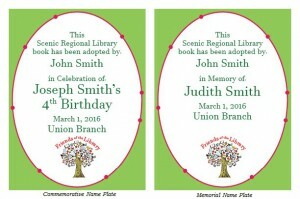 Adopt-a-book to honor a loved one or commemorate a birthday, graduation, or other special event. Adopting a book is also a great opportunity to help support the library’s collection. When a book is adopted, a name plate will be placed inside. The library has two types of name plates available, one for adoptions as a memorial (to honor someone who has passed away) and another to commemorate special events in a loved one’s life. You can adopt a book from a certain genre (mystery, western, thriller); adopt a book by a loved one’s favorite author (Janet Evanovich, Clive Cussler, Nicholas Sparks); or even favorite subject (American history, quilting, auto repair). Children’s books can also be adopted. A complete list of the books available for adoption can be found at the bottom of this page. You can request a specific title to be adopted, but it will need to be approved by the library’s administration. You can decide at which branch the adopted book will be placed. All proceeds from book adoptions are tax-deductible and will go to the branch’s local Friends of the Library group. There is a possibility that an adopted book will be lost while checked-out or weeded from the library’s collection in the future due to damage, eventual poor condition due to usage, or lack of usage.